However, choosing the platform can be so tricky. With numerous options and opinions out here, it can be difficult to make a decision. I started with Teachable, but moved to Thinkific right before I launched my PSP courses. Both platforms were really very similar, but it was the customer support that gave Thinkific the edge in my book. NOTE: There are intentionally no affiliate links in this post because I don’t want that to distract from my recommendation and the real goal of this podcast. Noele here from team Teachable 🙂 Even though you’ve opted to host your courses on Thinkific, I wanted to start by saying thank you for giving us a try and including us in this comparison! We’re glad to be a top consideration when choosing a course creation platform. I enjoyed listening to your podcast and getting a sense of your thoughts here! Since it sounds like customer care was the most important factor in this decision, I wanted to take a second to highlight some of the improvements we’ve made to our customer care recently — since things have changed a bit since you last evaluated. The first and most important thing we’ve done is to vastly expand the size of our customer care team. We started the year with about five people on our support team — now, we have close to 25. This growth has allowed us to significantly improve our reply time. You mentioned receiving a reply from our team in about 3 or 4 hours — now, we usually respond in less than one hour. Our team growth has also allowed us to open up weekend support, which means we’re able to help during business hours seven days a week. Additionally, we’ve rolled out live chat — we now offer this to all of our Pro & High Volume users, because we understand that sometimes, users need help quickly. Although I’d normally let these things speak for themselves, since this post offers a comparison — Thinkific provides support on weekdays only, and doesn’t have live chat. A final thought, since you mentioned phone support as a consideration — I can totally understand why phone support and the ability to get in touch quickly is important. You’re correct that we do not have phone support — that’s because with the size of our team and the nature of our product, we think we can provide better and faster support to our users over email. Email has the benefit of giving us time to investigate, and allowing us to communicate with our customers visually, sharing screenshots, links, videos/gifs, and articles. That’s one reason we chose to develop live chat as our “instant contact” option, rather than phone support. If we ever did decide to implement phone support, we would want to do it in a way that is really genuine, and represents the quality and reliability we provide in other support channels. From what I can tell, Thinkific’s “phone support” gives users the opportunity to call a number and reach an answering machine that tells them how to submit a ticket. While it would be tempting to do the same so that we can say that we “offer phone support” as well, that really doesn’t feel honest to us. We want to ensure that you can count on the fact that the support we advertise (channels and hours) works quickly and reliably, and gets you in touch with an actual human who is ready to help. I also wanted to point you to our instructor Facebook group, The Teachable Tribe — there are a number of threads there that provide people’s thoughts comparing Teachable and Thinkific, in case you want to take a look! Hi Noele, that’s great to know that you are working to improve customer service at Teachable! With regards to phone support, the one thing that stuck out in my mind was when I was researching which course company to choose, I was able to call that number on Thinkific’s site and ended up speaking with someone on the phone immediately to answer my questions. I was not directed to submit a ticket. But that’s great you are changing things and working to improve. Thanks for your reply, Lisa! Hope you had a terrific holiday 🙂 For anyone else reading this, happy to answer any questions you might have about Teachable. Is it because the other LMSs don’t have a way to “manage” the registration of participants and/or the payment for courses? Hi Denise, it was less about excluding those you mentioned and more about Thinkific just having everything I needed. Oh and there’s a contact form on this site to email me. I just listened to this episode and really enjoyed your take. I do have a question. I am in the process of creating a membership site and really had my eye on Thinkific for a long time because of the ease of use and I just really don’t want to have to deal with too much tech. However, I don’t hear too much about it being used for membership sites and that concerned me a bit. I currently am setting up with Wishlist Member on a sub-domain (and this is exactly the type of “tech talk” I’d rather not be talking 🙂 ) but I haven’t launched yet so I think I still have time to switch. Do you know much, or anything, about how Thinkific stacks up when it comes to running a membership site rather than courses? I’ve read their website but I would ideally like to hear from a real person not affiliated with the platform. I personally would not choose Thinkific or Teachable for a membership site. Now I do know that Thinkific has a recurring payment option where someone has to pay a monthly fee to access your course content. So technically you can set that up to work like a membership site and I believe people do. So let’s say you have Membership Level A that gets access to X content, you would create a Course for Level A with X content, and charge a recurring payment. You can even drip content out to those students at intervals you specify. Then you’d do the same for Membership Level B, C, etc. Just create a course for each Membership level. But I still think that for a true membership site you want a plugin that is made for that because you’ll have much more flexibility with grouping your memberships together and flexibility for the future. I worked with MemberMouse for a few short months and it was really, really flexible and you could grant access to content in so many different ways. It was very flexible. You can also integrate BuddyPress (WordPress forum plugin) with MemberMouse and some of the other plugins. That might be beneficial. But if you think that it will be as simple as being able to separate your members by course access then you could go with Thinkific, but always think about the future and what you MIGHT want to do with regards to granting access by membership level and any access overlap between courses/membership levels. That’s where it might get too complex for something like Thinkific. Give them a call and chat with them. I do remember the gentleman that I spoke with mentioned something about customers using them for memberships because of their recurring payment option, but is it flexible enough for what you need? So I would make a list of things you know you need and see if Thinkific can meet those. Thank you for reaffirming my decision to choose Thinkific for my first course. I did not like the fact that Teachable holds your money for so long. I too could not wrap my head around the logic of holding someone’s money for 30 days. wanted to mention that its not really that simple about holding the money. Teachable has both ways available. But if you are on their pro plan, you can run your own Payment gateway with Stripe and Paypal and then payouts are IMMEDIATE, the same as Thinkific. Really their own Thinkific price comparison isn’t accurate – how could it be? They are biased and trying to show their service in the best light. 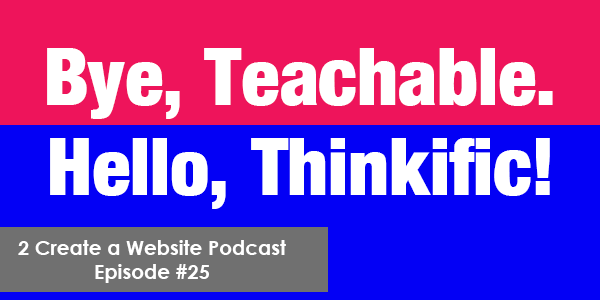 As It goes for customer service – Teachable really has stepped up and now Teachable and Thinkific are very similar in that sense. Basically Thinkific and Teachable are VERY SIMILAR. Both in employee size, age, features..but on deeper levels you will notice how these companies think differently. For most people starting out, there wouldn’t be any difference, but in Long Run there will be. Anyway, Lisa – really enjoyed the podcast (and I as WordPress user agree that people should try first using 3rd party..because of simplicity and speed before thinking of WP plugins or anything custom). Oh thank you Dainis, it was really helpful addition.. its confusing to decide. I wanted to let you know that I agree with everything that you stated. I thought I was nuts for choosing Thinkific since all I kept hearing about was Teachable. However, after my own experience with Teachable’s lousy response time, I went with Thinkific. I recently upgraded to Thinkific’s new course creator and I like it. Depending on which theme you choose once you upgrade you may need to manipulate the banner image (not a deal breaker for me). There was an issue with using bullet points, but it’s okay now (I alerted them and it got fixed pretty quick). I’m so glad you shared that chart and I HATE I forgot to mention the payment difference. That is huge! I just emailed them about switching over. I was still not sure what I would lose or have to change so I was hesitant so thanks for sharing that LaTosha!